"These are moist and have a wonderful flavor of spice. You can freeze persimmon pulp to use later if you grow your own and have an excess. These are great fall cookies!" Sift flour, spices and salt together, set aside. Cream together butter or margarine and sugar until fluffy, beat in egg and persimmon. Stir in dry ingredients. Stir in nuts and raisins. Since I found it, this has become my family's favorite cookie recipe! I like to add butterscotch chips instead of walnuts for those who don't like nuts in their cookies. What wonderful cookies! I used Splenda instead of sugar resulting in excellent cake like cookies. 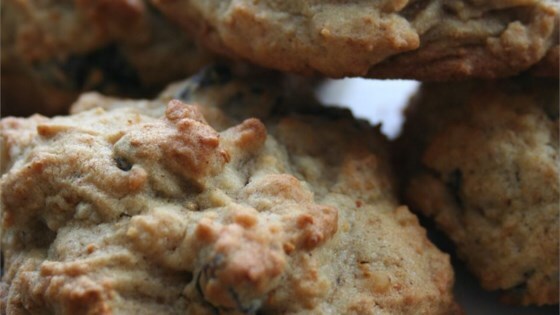 The best persimmon cookies ever! I used walnuts as the recipe indicated - excellent! The spicing is excellent as well.